Finished just in time for the cold weather: Monster Cowl . Started last winter, tucked away when I hadn't finished by spring. 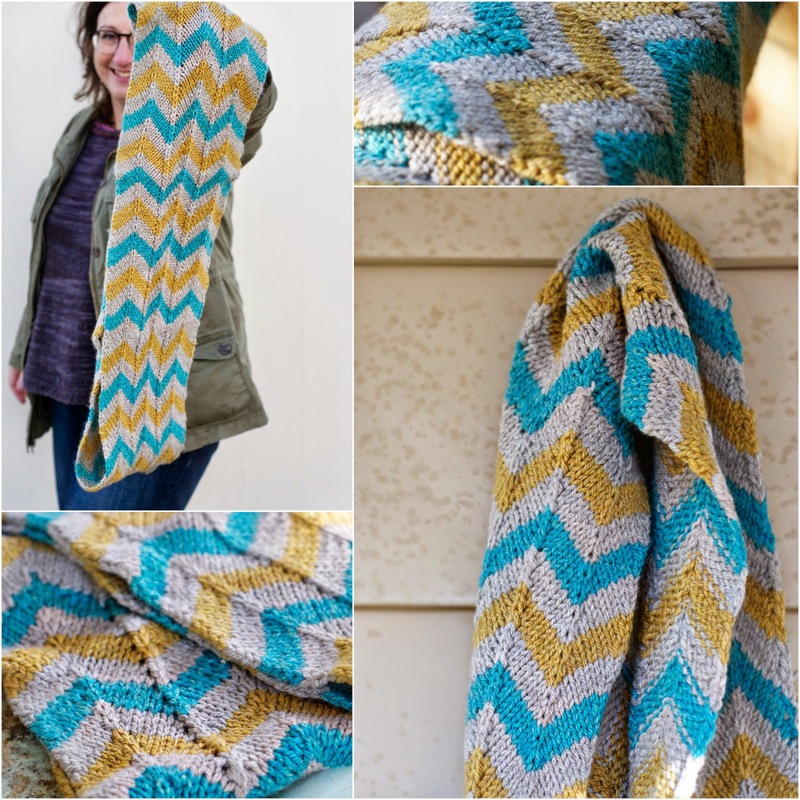 I love this chevron stitch, it's gently hypnotic to knit. I was chugging on merrily, when I noticed the pattern suggested stopping to kitchener it at 45", warning of blocking growth. ooops! I was closing in on 50". No worries. I love the size. Excuse the, ummm, styling, or lack thereof. It was an impromptu photoshoot. Want some details? 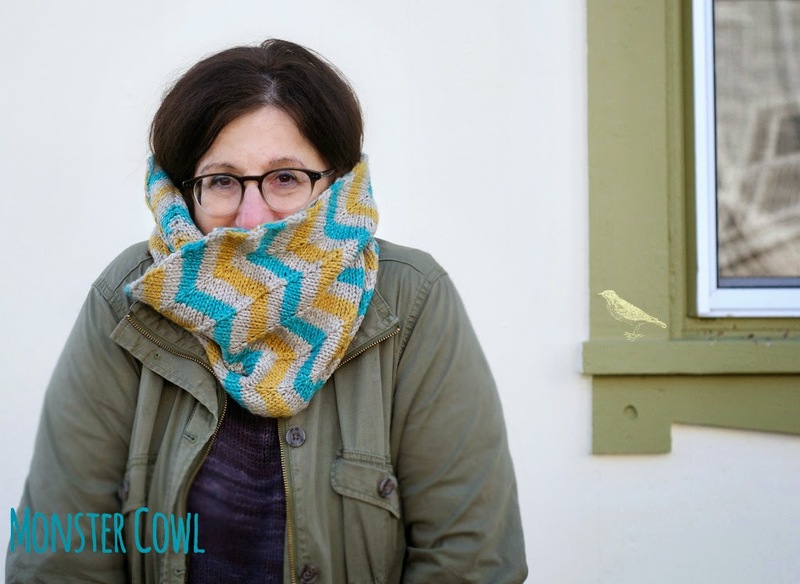 pattern: Monster Cowl by Julia Allen. notes: so obviously, one edge is going to be nice and neat and the other, the side where you change colors, is going to have the yarn carried up along it. I'll fess up to sometimes forgetting to properly wrap the working yarn around the one lying fallow for that row. (oh man. I just fell down this grammar rabbit hole and I am still not sure if I used the past tense of lie correctly or if maybe it should have been laying). Oh yeah, my less-than-neat edge. Before blocking, it was messy enough to considering covering with icord all around, or maybe a row of crochet. Afterwards, it settled in A-OK. Don't you love well behaved yarn? This was so satisfying to knit that I may cast on for one as a gift for someone I like who admired it repeatedly in that kind of way. I've already cast on for a coordinating hat. Those skeins are generous at 250 yards each. Not the Monster Hat- that would be too matchy for me --but using the rest of the yarn held double for a bulky hat. 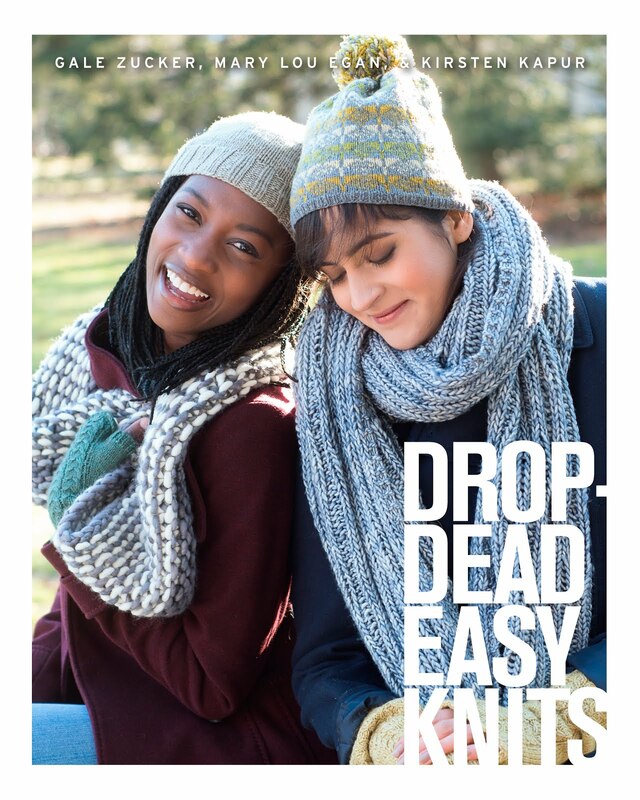 What are you knitting this fine frosty morning?